Did you hear about Dr. Paul Bajor’s double knee injury? On February 20, 2019 (his birthday conveniently), Dr. Bajor suffered a gruesome knee injury to both knees. Watch the video below for details! This is Dr. Paul Bajor with Access Chiropractic and Wellness. This video is an update to tell you about an injury I incurred to my knees. On February 20, 2019, on my birthday, I took my kids to a trampoline park and we were fooling around and before I jumped off a ledge onto the trampoline I said to my daughter, “Hey Julia, watch this!” and my knees buckled, I heard a horrible snap, and I knew I had done some serious damage. Sure enough, I tore my patellar tendons, ruptured them completely, off both knee caps. <Dr. Bajor describes how the tendons attach to the knee cap.> I was admitted to Foothills Hospital on that Wednesday, during which there was a snow storm, so they had all of the trauma from southern Alberta from accidents, so I was bumped Wednesday and then Thursday for surgery. On Friday I had surgery. They re-attached the tendons where they drilled 3 holes in the knee caps, weaved the tendons back and forth, cinched them with some super strong thread, and then closed me up with 50 staples between the two knees. 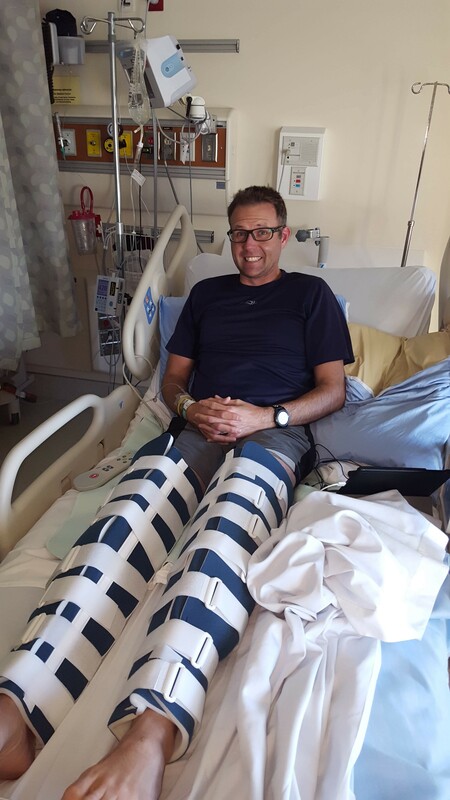 I was upright the night of the surgery and walked up and down the halls of the hospital with a walker which was great, but for the next two weeks I had to wear Zimmers, which are foam wraps that are tightened up with Velcro straps to keep my legs straight. A few weeks ago I went to get the Zimmers taken off and staples removed and I got braces that limit how much my knees can bend. They started at 15-20 degrees and over the next few weeks I worked on exercises to increase my range of motion, did a lot of cold laser therapy on the injury itself, both on the seam of the cuts and the swelling, and then saw the surgeon who checked on everything. Swelling is down, scars are looking fantastic and look like they’re several months (not weeks) old, and he said that everything is looking really good. He increased the amount of flexion from 20 degrees to 40 degrees bending, which is fantastic because that’s all I need to practice, and as long as I kept them at that for the next few weeks, then I could go back to practice because there is no risk of injury because the braces limit how much I can bend. I’m pleased to say that not even a month after the injury, I’m cleared to go back to work on a modified schedule and patient load, and as I get stronger I can return to the usual work load. In under 3 weeks I’ll go back to see the surgeon again and at that point in time, if things are looking well, I can probably take the braces off, which would be unreal, even though I would likely keep them on in practice until I’m comfortable and strong enough. Now, why did this injury happen? Nobody knows! In fact, they were asking me if I use or used steroids. I said, “look at me, does it look like I use steroids?”. They also questioned if I was diabetic because tears like this are common, but not across both knees and that can weaken tendons. In the end, this was just one of those freak accidents. I always tell patients they should keep up with their regular chiropractic visits, once every two or three weeks to stay nice and healthy. This doesn’t mean you’ll never land up in injury, but if you do, your bounce back will be fast. So look at me for example, I get adjusted all the time, and the one thing they told me from the very beginning was: you’re really healthy, you’re young, you’re active, you’re physical and you’re strong; your recovery is going to be fast. Barely one month after injury I’m told I can go back to work as long as I follow the rules; this is at least a month ahead of schedule of what we expected based on the norm. This is phenomenal and amazing news! If there’s any reason to stay healthy, keep up on eating healthy, exercising, regular chiropractic care, this is living proof! Hopefully you’re having as great of a day as I am, looking forward to seeing you back at the clinic as soon as possible! This is Dr. Paul Bajor at Access Chiropractic and Wellness. Please feel free to visit our Facebook page at www.facebook.com/accesswellness! Dr. Jacqueline Boyd and Paul Bajor are the only husband and wife chiropractic team in Airdrie, Alberta. Their practice, Access Chiropractic and Wellness, is located at #120, 52 Gateway Drive NE in the north of Airdrie. They have been in practice in Airdrie since 2004 and in practice since 2001. They have two kids named Liam and Julia and have a large family based practice. They have a vested interest in keeping Airdrie and surrounding communities healthy because Airdrie is also their home. Here’s a throwback to this summer when we had an opportunity to get some hiking in. We have to give credit to our patients for recommending this hike and my only regret is that we did not listen to them earlier! WHO can do this hike? You have to be reasonably physically fit and I recommend having hiking boots or shoes at minimum. 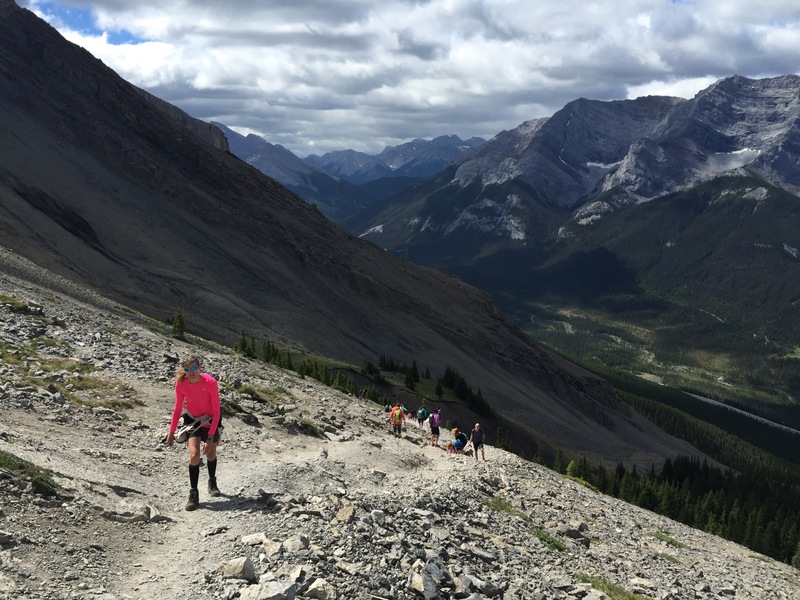 We did see some kids along the trail and even a 5 year old at the true summit, although that was quite impressive for that age! It is 13.8km return. We had a steady pace with about a half hour for lunch at the summit and it took about 2 hours up and 1.5 hours back. This is a fantastic hike and, best of all, it’s not that far away. 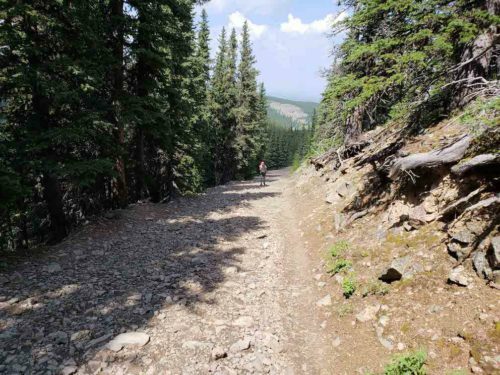 Only 40km away from Calgary, take Highway 22x which becomes Elbow Valley Trail (Hwy 66). 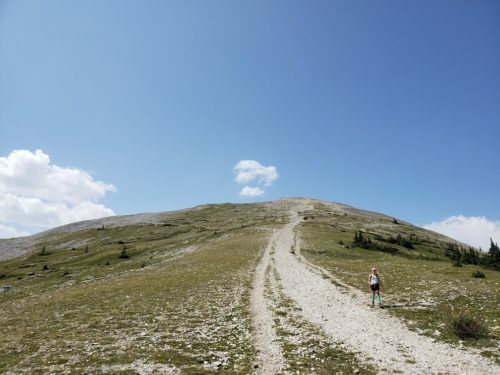 Take the exit for Moose Mountain Road which ascends about 7.5km straight up (rough gravel road). There is a parking lot, but the entrance to the hike is past a double gate which will be on your right. The entrance to the hike is BEFORE the parking lot, not IN or PAST the parking lot (we thought we wouldn’t miss it either but we did!). The hike starts with a slow easy ascent and then descends deeply for 1km. That all seems fine and dandy except that you have to climb this at the very end when you return and are dead tired! It goes through the woods on a fairly wide path for most of it, and the inclines are not that bad. You will definitely know when you break out of the trees because the trail will open up into beautiful and wide plane, the false summit ahead with the true summit hidden behind. Even when you start climbing to the false summit, the views will be amazing. The false summit climb can be done via switchbacks, or, if you have good boots, straight up to cut down some time. We went straight up for the most part but did some switchbacks where it looked too steep. The switchbacks are fairly easy but make the hike longer. If you are so inclined and have good boots, you can mountain goat your way straight up, which is what we did. You get a great workout and you save some time. Once you reach the top of the first summit, you will feel accomplished. You will enjoy your time there, take in the amazing views, and be happy. You will feel like you have conquered the mountain. But you haven’t done that quite yet. Many people make this the final destination and then turn around and descend after having lunch or a snack. You just feel that good! After the false summit, you descend for a short period to wear the pathway to the true summit begins. When you look upwards, you wonder to yourself “where does this pathway go?” It is very hard to see from the bottom where it leads and it is also very deceivingly narrow and dangerous from a distance, but as you start hiking it you will realize that it’s not as bad as it looks. And it will be worth the trek, trust me. 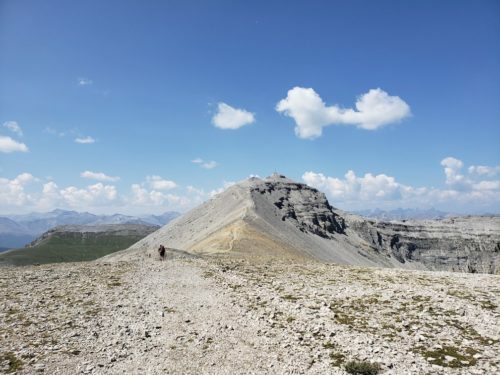 You are literally walking on the side of the mountain with a sheer drop off to the side, however you are on the calm side of the mountain so there is no wind to make you unsteady. 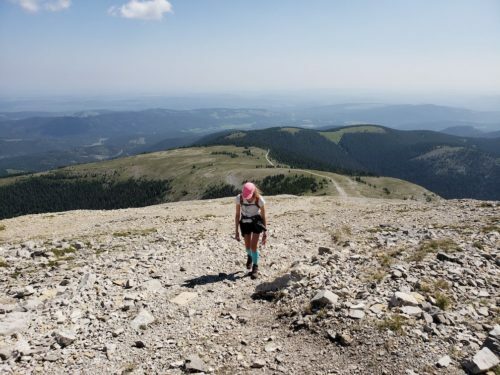 You proceed along the side of the mountain at a fairly steep grade for a short period of time. And after a hard and solid climb up the side of the mountain, you finally reach the true summit! And is it ever spectacular! 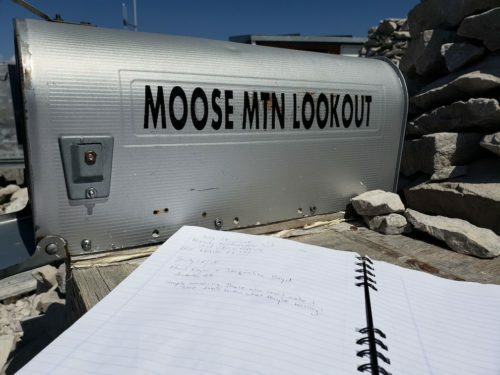 Moose Mountain is an active and fully operational fire lookout. It comes with a lookout tower and a helipad which is perfect for sitting down for a while and eating your lunch while enjoy 365 degree viewing. The man who works the fire tower came out a few times taking measurements and chatted briefly, but realistically he has a job to do and does not spend much time with the public. You’ll stand at the top and marvel at your accomplishment and realize that not many people get to stand where you are. You should make sure to sign the guestbook at the top. I always find it neat to look back in the book and see what people wrote and where they’re visiting from. Then you step back one more time and realize that this hike, this amazing view, is right in your back yard, and didn’t cost you a single thing except a bit of time and a bit of energy. But it’s all worthwhile! Life is too short. Enjoy it ALWAYS. Please feel free to visit our Facebook page at www.facebook.com/accesswellness! 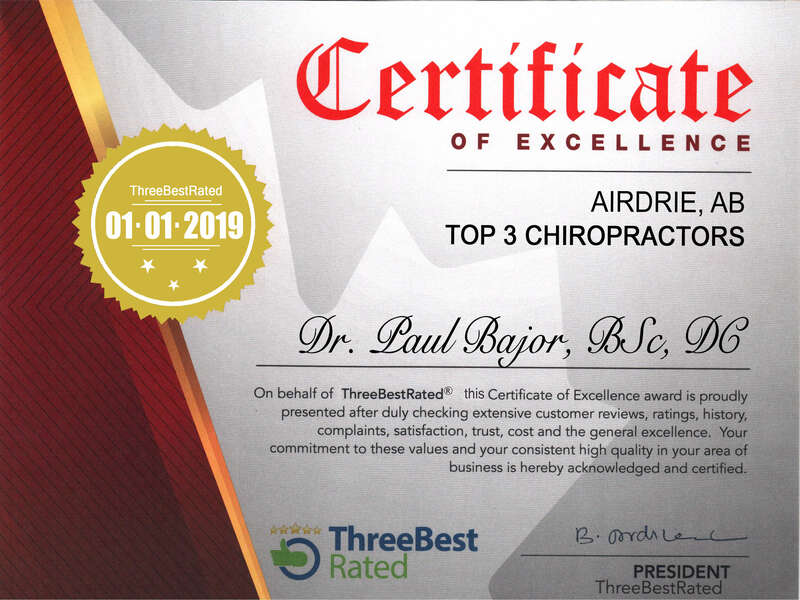 Dr. Jacqueline Boyd and Paul Bajor are the only husband and wife chiropractic team in Airdrie, Alberta. Their practice, Access Chiropractic and Wellness, is located at #120, 52 Gateway Drive NE in the north of Airdrie. They have been in practice in Airdrie since 2004 and in practice since 2001. They have two kids named Liam and Julia and have a large family based practice. With these doctors, you get what you see because they practice what they preach. Dr. Paul Bajor of Access Chiropractic and Wellness explains why this is far from the truth and why, in fact, you should see a chiropractor for the rest of your life. Watch! Hi, I’m Dr. Paul Bajor of Access Chiropractic and Wellness and today I’m going to dispel the #1 myth about chiropractic: once you start seeing a chiropractor you have to keep going forever. Why is it so prevalent to hear this because our line of thinking already supports this? Let’s say your vehicle starts to make some noise or the check engine light goes on and you go in to get it checked and the mechanic fixes it, and then he says I’m going to see you in six months for an oil change at which point we’ll run a check for all the different systems. Chiropractic is no different. You may come in for neck or back pain and you go through a course of care and then you move towards being seen on a preventative basis, once every two to four weeks, pain or no pain, just as a checkup or tuneup. Why is that the case? Lots of stresses build up in life just like tartar and plaque will build up in your teeth, or maybe you wear your contacts for too long or there are irritants in your eyes, or maybe you drive your vehicle hard in the back country or you use your brakes a lot, and this wears it down more, all of these preventative visits (whether a dentist, or optometrist, or mechanic, OR chiropractor) are there to ensure that you don’t land up in the same problem when you first came in. Let’s say you come in, I see you for an adjustment, and then I make sure you’re doing all the other lifestyle adjustments that we talked about. Maybe you’re having a lot of stress at work? Maybe you’re working long hours? Maybe you’re not getting enough sleep? Maybe you’re not getting enough exercise? Maybe you have kids who aren’t perfect like ours (haha), who are driving you bananas? All this increases your stress levels. The regular adjustment first of all makes sure your nervous system is healthy, and secondly it re-affirms the importance of making those lifestyle changes and that you adhere to them, because without that, there is no way you can be healthy. The purpose of that returning adjustment is to make sure that not only do you keep your nervous system healthy, but we support it through all the other lifestyle changes that we talked about leading up to that preventative adjustment. I’m Dr. Paul Bajor at Access Chiropractic and Wellness, have a great day! Please feel free to visit our Facebook page at www.facebook.com/accesswellness! You can also call to book with Dr. Bajor at the north location behind the Superstore at 403-945-1349 or contact the south location in the Airdrie CO-OP at 403-945-0855 to book with Dr. Jacqueline Boyd! When we have no pain, we are happy, we are well, we think we are healthy. However, when we are in pain, we have two questions: how did this happen? AND how long is it going to take to get better? This video blog uses a simply example to show how long it takes to make changes in the nervous system with chiropractic care to not only get pain relief but also to get healthy! Transcription is after the video! Thank you for watching and learning! Let’s use a real life example of how things work: behind me are two cabinets, one has plates and one has glasses. For 10 years we’ve had the plates in one cabinet and glasses in the other cabinet, and about a year ago my wife said that we should switch the contents around because one is slightly larger and would accommodate the plates better. I said “FANTASTIC IDEA! WE SHOULD HAVE DONE THIS YEARS AGO! WE MUST DO IT IMMEDIATELY!” So we changed the contents around. You can imagine how that ensued for the next while! The first month I got it right maybe 10% of the time, by about a half year it was about 50%. A year has passed and about 80% of the time when I reach for something, I’m right, however under times of stress, where I’m cooking and it’s burning and the kids are yelling and the phone is ringing, the doorbell is ringing, and I need to reach for something, I will almost always go for the wrong one. That’s because that neurological pattern has developed for the last 10 years. Is it realistic that after one year I haven’t gotten it right yet? I think it is. Changing something that has been established for 10 years after one year is a really short time. Let’s apply this to your own health. 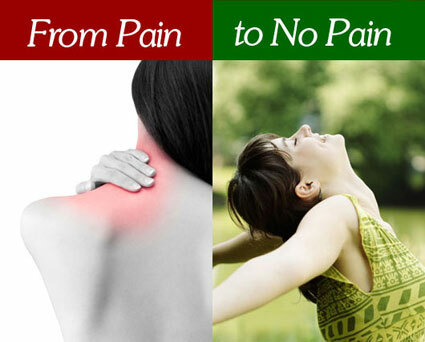 We know that most pain, whether it’s gradual or sudden, will develop underlying for months to years. So is it realistic to think that after 10 or 15 or 20 visits we’ve changed these patterns? Probably not, no more likely than let’s say you’re trying to learn guitar song, or a new gymnastics routine, or you’re trying to get that short side top shelf goal, if you practice it 10, 15, 20 times, will you have attained that level that you want? Probably not. Changing patterns, nervous system patterns especially, takes time, effort, and dedication. Let’s say you get to that point where you’re feeling well, you have no pain, is it realistic to think that if you continue along the same pathways that you did before, that you’re going to stay in that same good health? Realistically no! You have to SUPPORT that nervous system. You have to support those changes. If you learn that song or that new gymnastics routine or you consistently get that top shelf goal, and if you don’t practice that and maintain that pattern, in let’s say a month, are you going to be at that same level? The answer is again, NO. Maintaining proper nervous system pathways and proper neurological health, which leads to your day to day good health, takes time, effort, and dedication. At the very start that requires repeated chiropractic visits, and active icing and stretching. As you get further and you get out of the pain, you still have to maintain that nervous system, and you still have to establish those patterns. Those patterns have not been established after that short of time. If you don’t support that, and that’s through specific exercises and regular chiropractic care, you’re going to land up in the same scenario that brought you in. You CANNOT expect to have that level of health you want without putting in some work. It’s not a lot of work believe it or not, but it requires some work. Making changes in that nervous system and creating proper neurological pathways takes time, dedication, and repetition! Quiet. Silent. Unassuming. You would never think twice that it could bring you down to your knees in an instant. Like a siren singing songs and luring sailors to their deaths in the ocean, the delicious wafting smell of the Christmas turkey is the same culprit in a tastier form. Every year we have at least one patient who comes in with acute back pain that is secondary to tending to the turkey in the oven. Why? Well, most turkeys we cook are heavy. But it’s not just the fact that they’re heavy; taking turkeys in and out of the oven is difficult because of the oven door. 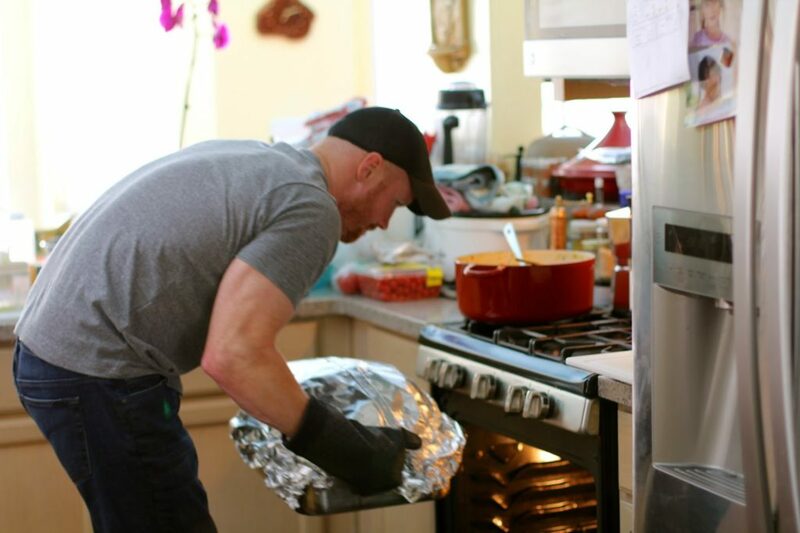 To avoid burning ourselves, most of the time we are bent over awkwardly and have our arms outstretched when handling the turkey. “But it’s only 15-20 pounds, it’s not that bad!” WRONG. Research shows that any weight in your hands at ARM’S length is anywhere from 3-10 times as heavy as it is. So that 20 pound turkey is actually anywhere for 60 to 200 pounds in weight. The best is if you have a tray that pulls out and you move to the side of the oven and pull the turkey out, keeping it closer to your body while your arms are bent. That will ensure your Christmas is much more spine-friendly. These turkeys can also be heavy! Leaning over the railing to put down and pick up your baby, especially when he/she starts to get larger and heavier can also be detrimental to your back. 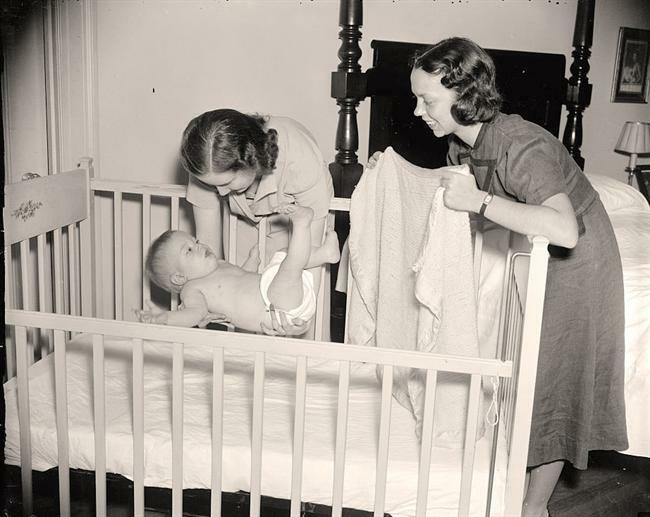 Best way to combat this ‘baby-back’ is to first off have a crib where you can adjust the side railing. The ability to bend down at the knees and place your baby into the crib is best, however if that’s not possible, then next best is to slide your baby closer to the railing if you’re picking up, or placing closer to the railing if putting down and gently moving him/her over. The closer any weight is to your body on picking up/putting down the better. And yes, sometimes putting a baby down and keep him/her asleep is like trying not to set off a landmine, that I can absolutely understand, so do your best! Mindful placement in both instances will ensure that neither Turkey 1 nor Turkey 2 will put you out of commission for Christmas! 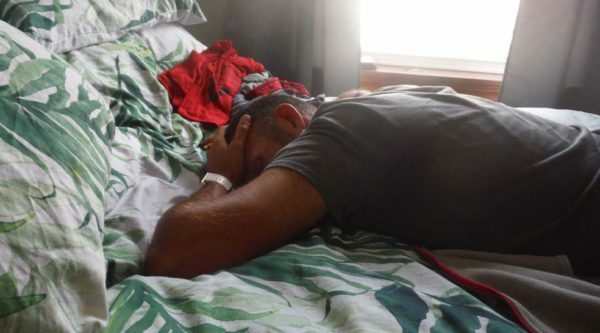 This blog story tells you about a personal health battle I fought years ago and how you may be affected without even knowing it. Click on the YouTube link below to watch the video blog. The transcribed version is below it! About six years ago I was sitting in my basement working on my computer when I felt some twitching into my calf muscle. 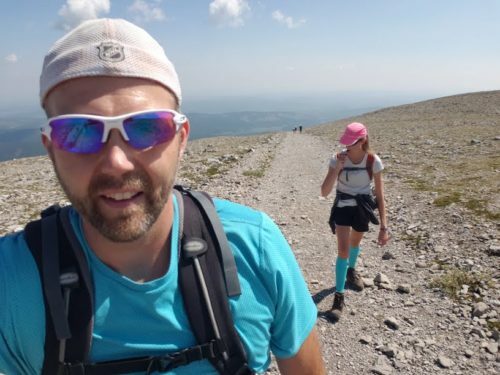 I didn’t think anything of it, I was training for a race at the time, so just thought it was part and parcel, but as the days ensued, I got more twitching throughout the rest of my body and muscles; as time passed, a few weeks later, I started to get a lot of stiffness and ache, my legs started to feel like they were turning to cement if I sat or walked for more than a half hour at a time, and obviously this started to get concerning. So I decided to go see my medical doctor to talk to her about my issues and she decided to send me for some blood tests. The blood tests ended up coming out normal, so she decided to send me to see a neurologist. As I waited, I started to notice I was experiencing fatigue, light headedness or dizziness, and by the end of the day I was exhausted. I would go to sleep early and wake up the next day feeling like I had run a marathon the night before. Even grabbing a jug of milk out of the refrigerator was very tough. When I finally got to see the neurologist, he went through a bunch of different tests and he could not find anything wrong. He said that we should wait for a few more months and monitor my status. Four months later I saw him again, the symptoms started to worsen in terms of the fatigue; he did further testing and again, nothing new showed up. He sent me to a physiatrist who tested my cardiovascular system and again, everything normal. So back I went to my medical doctor who proceeded to say she wasn’t quite sure what was wrong, but could send me for some more blood tests. I told her that after having gone through all these blood tests and nothing being found, I would rather not go through more, but I would be willing to try a vitamin D blood test. It was something I had thought of just on a whim and she entertained the idea but said, “Well, I can send you for one, but I really don’t suspect you have a deficiency: you’re young, you’re active, you’re outdoors all the time, you even take a vitamin D supplement already, I highly doubt you have a deficiency, but I’ll send you for a test.” Two weeks later, I discovered I had a vitamin D deficiency. Vitamin D is a very important vitamin because it is a fat soluble vitamin and can only be synthesized from the UV rays of the sun. Here in Alberta where we are located, between the months of September to May, there isn’t enough strength in the sun to create that vitamin D that we need, thus we have to get it from somewhere. If you look at diet and foods that are high in vitamin D, a 3 ounce steak of swordfish, which is high in vitamin D, has approximately 550 IU of vitamin D. An 8 ounce glass of milk, which is fortified with vitamin D, has about 120 IU of vitamin D. The average amount of vitamin D you should take is approximately 5000-6000 IU of vitamin D per day. Thus, that’s a lot of swordfish and milk that you have to consume in a day to reach your required vitamin D intake! The rule of thumb is 35 IU per pound of body weight is what you should be supplementing with per day. Once I started supplementing it took the better part of a year for me to start to feel normal again. The strength and stiffness issues I had changed very quickly, but everything else, energy levels especially, took a while, so you want to make sure you’re not deficient. There are a lot of people out there who are deficient who have no idea that they are, and our system no longer does vitamin D testing because it is ‘too expensive’, so it is hard to figure out if you are deficient. 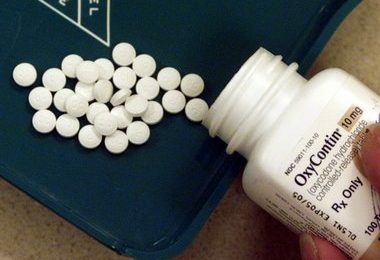 Hopefully you take from my story that vitamin D supplementation is important and there are a number of different symptoms you can be experiencing that could easily be remedied with supplementation. Even if you have no symptoms and you do not supplement with vitamin D right now, please start supplementing, and please make sure to choose a supplement that is of high quality and high absorption. 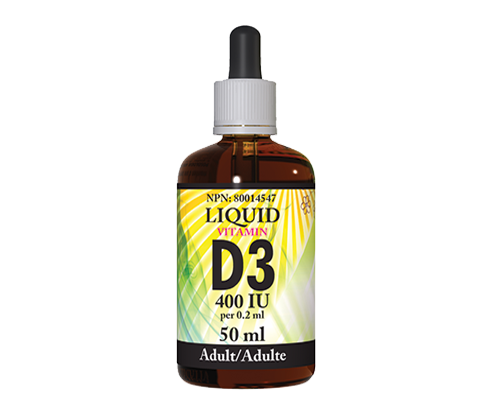 At our clinic Access Chiropractic and Wellness, we sell vitamin D supplements in a liquid form from a Calgary company called AOR which has very stringent quality control testing and high quality products. Vitamin D is needed for a lot of different bodily functions most notably the skeletal, nervous, and immune systems. Do not be deficient! 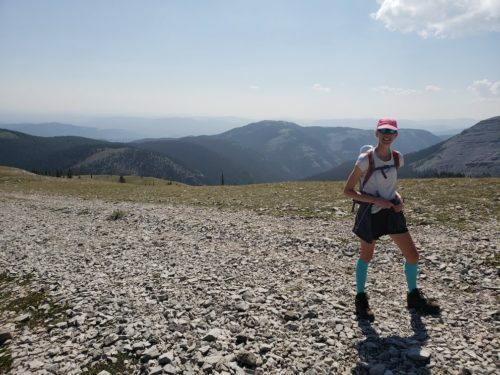 This post serves a two-fold purpose: to tell you about one of the most fantastic ways to avoid getting blisters and to review this popular and challenging hike. 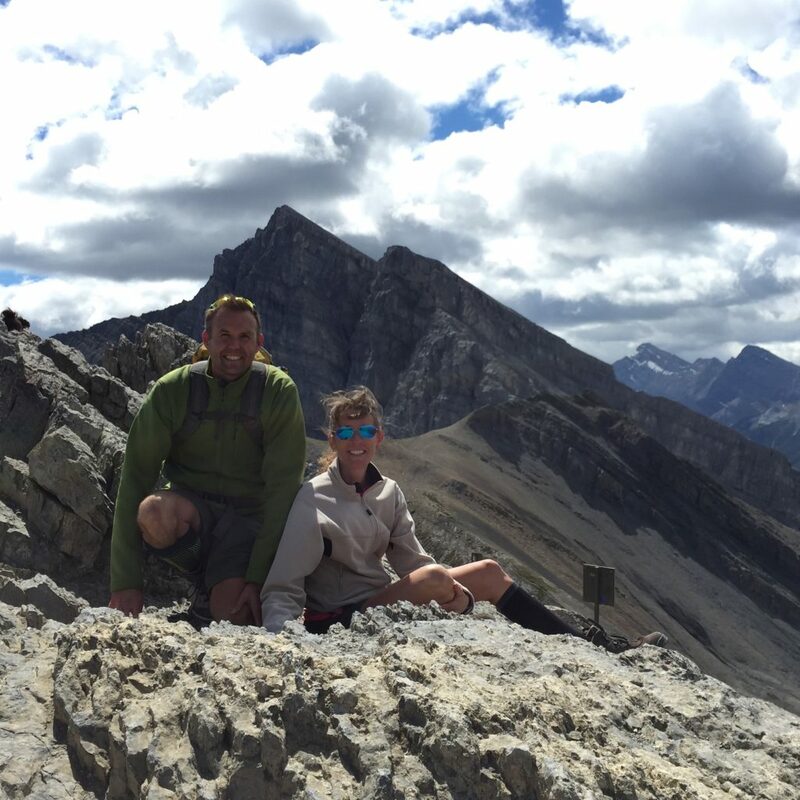 Our patients are always asking our advice on where to go hiking in the mountains. We are a very active family and take full advantage of being right next door to the one of the most amazing places in the world. The first half of the post: blisters prevention for those who aren’t into hiking and just want the info. A blister is simply a pocket of fluid between the upper layers of skin. In the athletic world, it is secondary to friction. It is annoying, painful, and can have you walking oddly for days while throwing your whole nervous system out of kilter. As active as I am, I am prone to heel blisters with hiking. 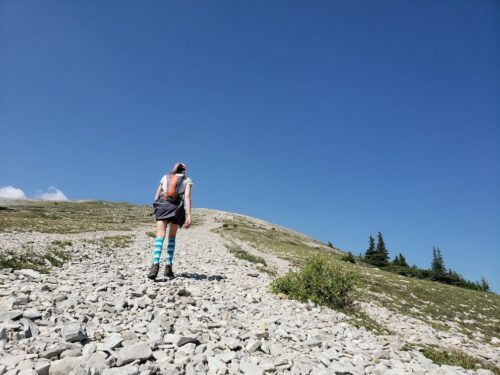 I have tried it all: different types of hiking boots, mole skin, duct tape on the heel (yes, duct tape), bandaids, baby powder, anti-perspirant….. everything. Nothing worked. I was doomed. Until I (by complete accident) came across another benefit of compression socks years ago. And now, the second half of the post: the hike. 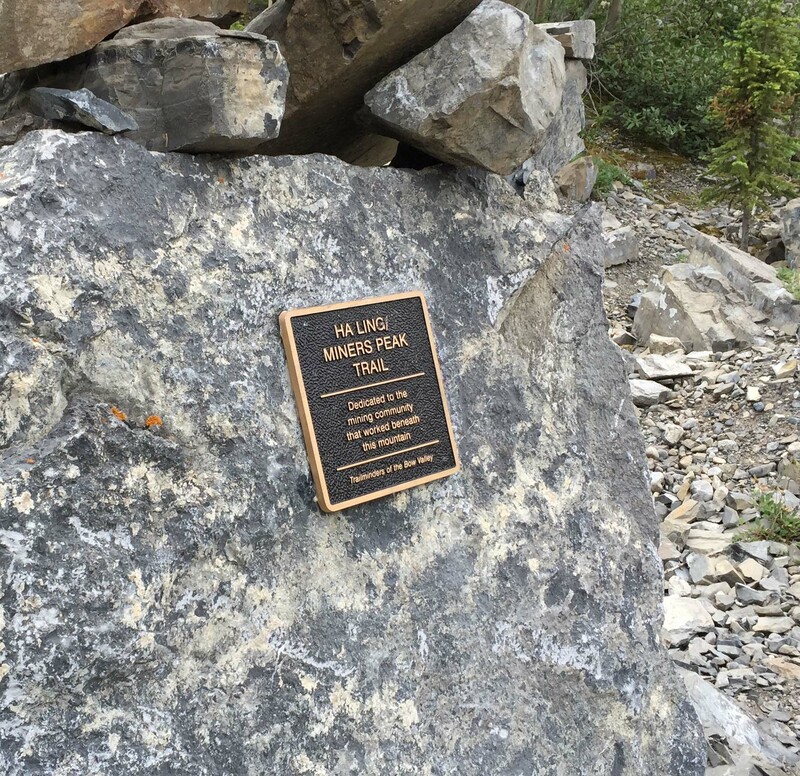 Ha Ling Peak was a great hike to test these out on because it is truly the first hike I have been on (and I’ve been on many) that is literally an unrelenting climb straight up with almost no flat portions. However, that makes it a relatively short hike (6km return), with a crazy altitude gain of 737 meters (2417 feet)! It’s a heel crusher on the way up and toe pounder on the way down! 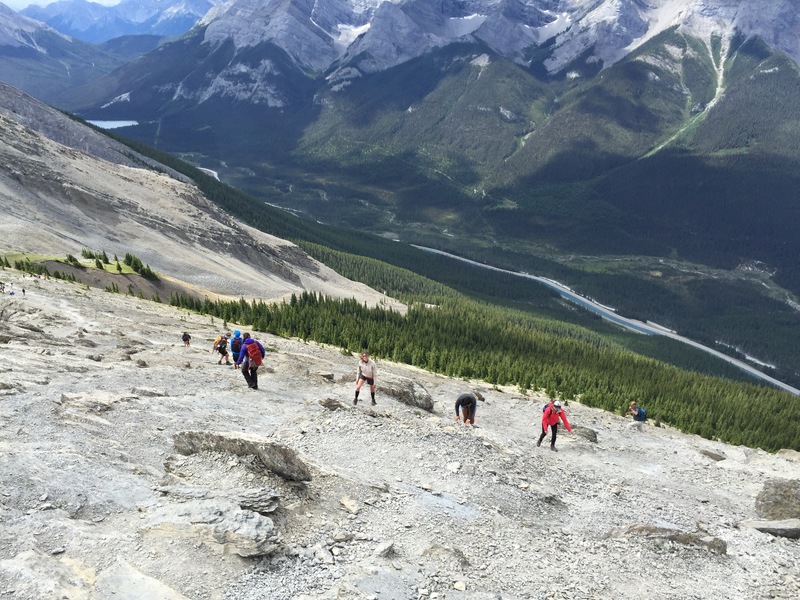 You have to be in reasonably good shape to do this hike! 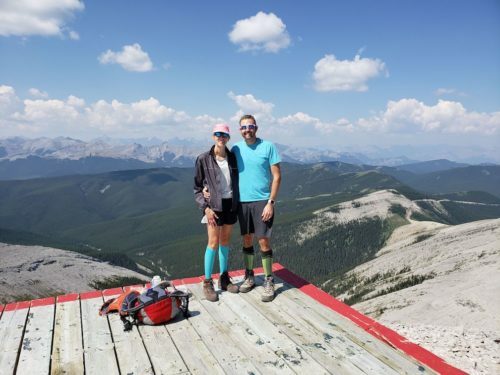 The good news is that you’ll be hiking with a ton of other people as it is one of the most popular hikes in Kananaskis. When you get to the top, it will be very windy and even in the dead of summer quite cool, so ensure you bring pants and a jacket. Weather at the top of a mountain is much different than at the bottom! And because it is so populated, you don’t have to worry about bringing bear spray. Although one does wonder why any bear would want to even come close to a near vertical ascent! There is no clear path, your guess is as good as mine! Finally at the top! Well worth it! Make a day of it. Challenge yourself. Live life and enjoy! Dr. Bajor addresses why we land up in the pain we do in the video below. Sometimes the pain develops over time and we can feel it but don’t do anything about it until we can barely move, but a lot of the time we land up in pain when the day previous we were fine; we search for answers as to what happened between yesterday and today and wind up empty. Watch below for a great analogy that will hopefully make things clear! Now if you’re watching this then you’re probably not in acute pain and can reason that the likelihood of having a really vigorous sleep or a tough time putting socks on today is really no different than any of the other days that you did, so probably that wasn’t the cause. More than likely this was caused by the accumulated stress over time. So, one of the best ways to explain this is using an analogy of a weightlifter: let’s say there’s a weightlifter and he has a barbell over his shoulders and people are putting on 25 pounds of weight at a time, and people are loading them up and he starts to shake and teeter and at the last second someone puts 2 pounds on and he collapses. Now, was it that 2 pounds that caused him to collapse? No, it was the accumulated weight over time and that last 2 pounds was that ‘extra’ or that ‘tipping point’ that was enough to put it over the edge. This is the same case with you: the nervous system, which handles all the different stresses on the body, is usually pretty good at dealing with this, however the days on end of working 10-14 hours straight, the kids fighting amongst each other, the lack of sleep, 5 hours at a time interrupted at best, or perhaps eating that fast food in and out because there’s no time to cook because you’re running from one appointment to another, all of this builds builds and builds, hits that point where your body says it can’t do it anymore, your nervous system collapses, and you land up in pain. 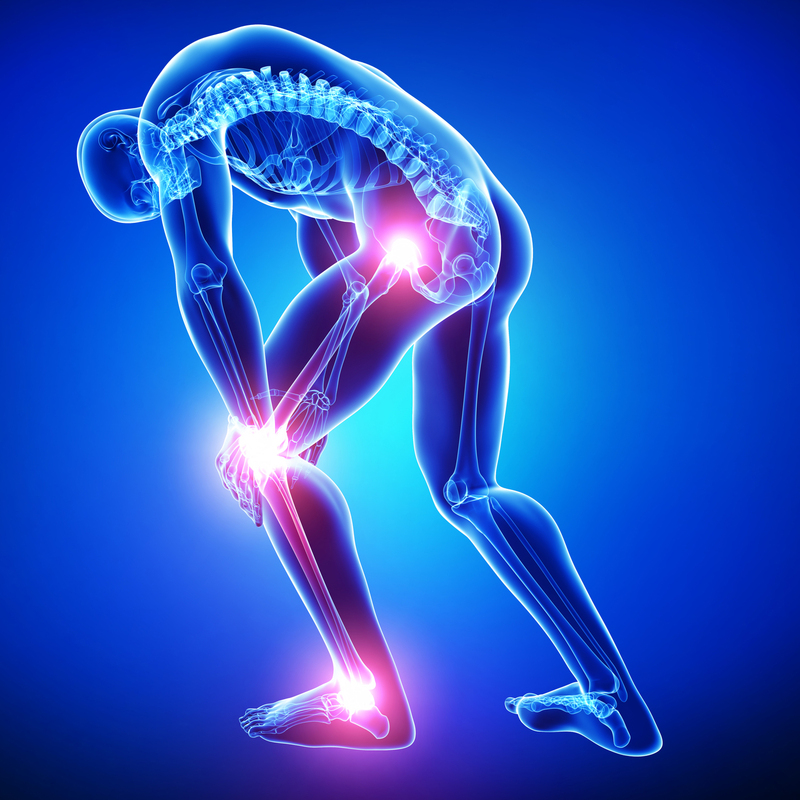 At that point you come into the office, chiropractic no doubt will get you out of that pain and discomfort; however, more important are the continued adjustments that you get past that point where you are out of pain are what really count. That is our opportunity to ensure your nervous system is healthy and it’s also our opportunity to check with you: are you stretching actively? are you getting enough sleep? are you doing the exercises to stabilize, are you maximizing your health and taking care of yourself. This is because if you are not doing all of these things together, you’re going to land up in the same scenario that first brought you in. All of this is to ensure that you are living a good, healthy, proactive and healthy lifestyle and experiencing the most you can out of life!